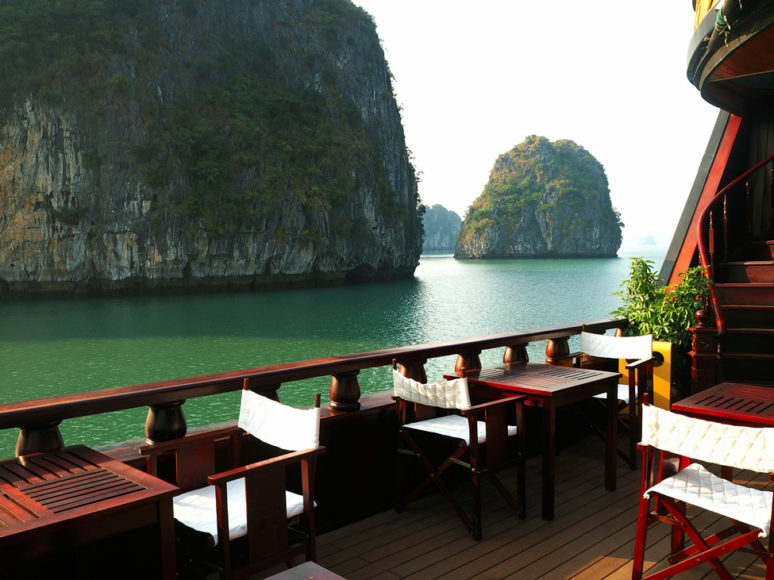 Enchanted Ha Long Bay stretches from the northern coastline of Vietnam into the Gulf of Tonkin. “Enchanted” really is the right adjective to describe this wonderful place. 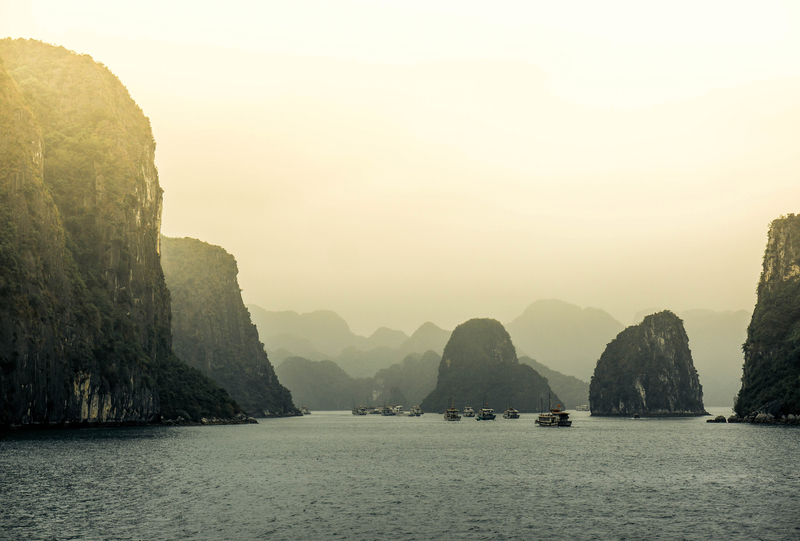 It is no wonder in 1994 Ha Long Bay was designated a World Heritage Site. 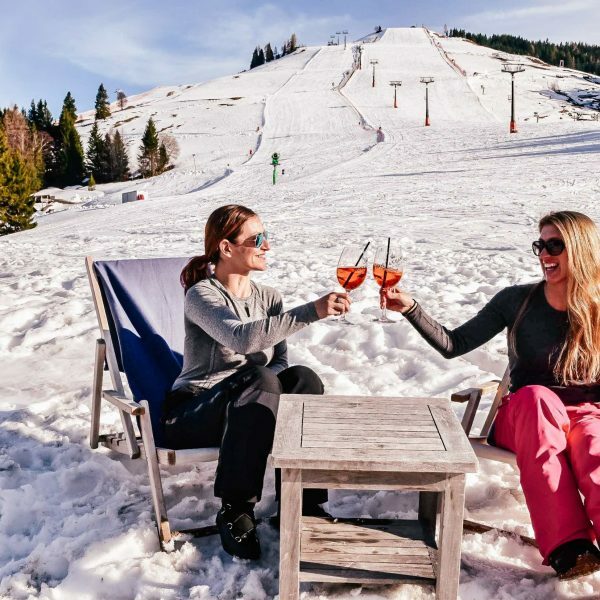 Whether you admire the bay gorgeous landscape from a panoramic spot on the mainland or from the deck of a cruise ship, I can assure you that it’ll be an unforgettable experience. To visit the bay one can choose either to take a one-day cruise or stay overnight on one of the many cruise ships that offer different tours of the area. After some online research my boyfriend and I decided to book a two-night cruise with the best rated agency on Tripadvisor, Indochina Junk. 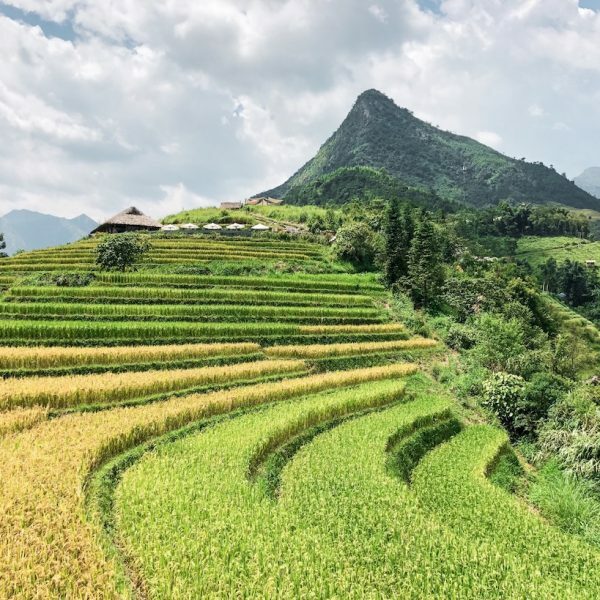 Yes, we definitely overshot the budget for our 5-month trip in Southeast Asia but after having mulled over the purchase of this luxury cruise for a while, we decided that it would be worth the expense… and we were so right! 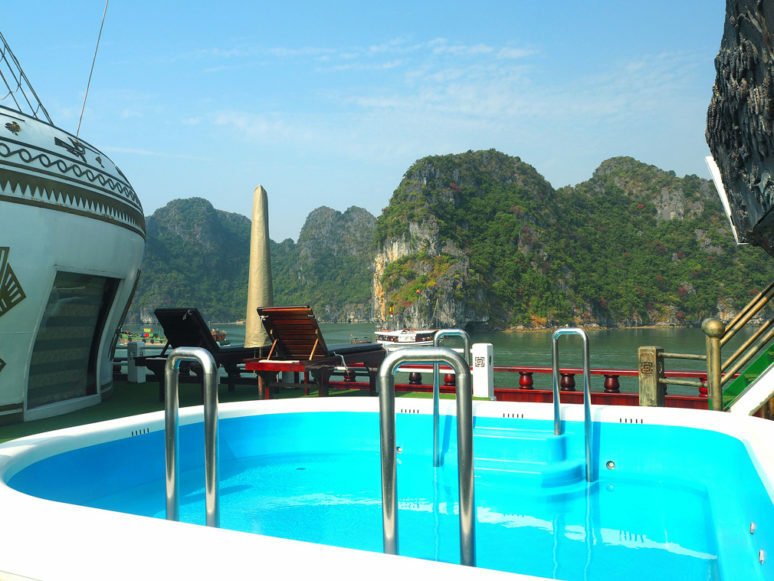 When we arrived in Hanoi we looked for the Indochina Junk office and booked a double cabin on the Dragon Legend. This ship sails in Bai Tu Long Bay, which occupies three quarters of the Ha Long Bay World Heritage Site. 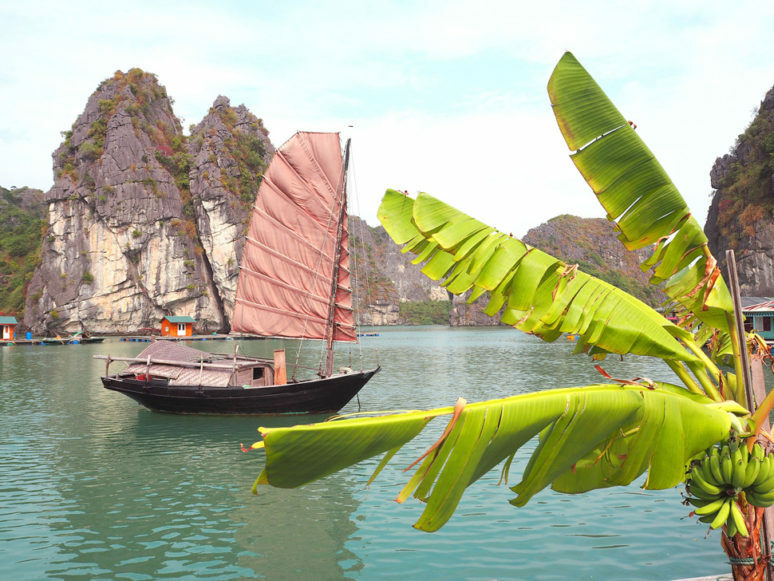 Since Ha Long and Bai Tu Long bay are part of the same limestone plateau, both of them are characterized by the famous isles that made this place so popular. What’s great about Bai Tu Long is that this part of the bay is still not too touristy. This means you’ll find only a few other ships sailing there. 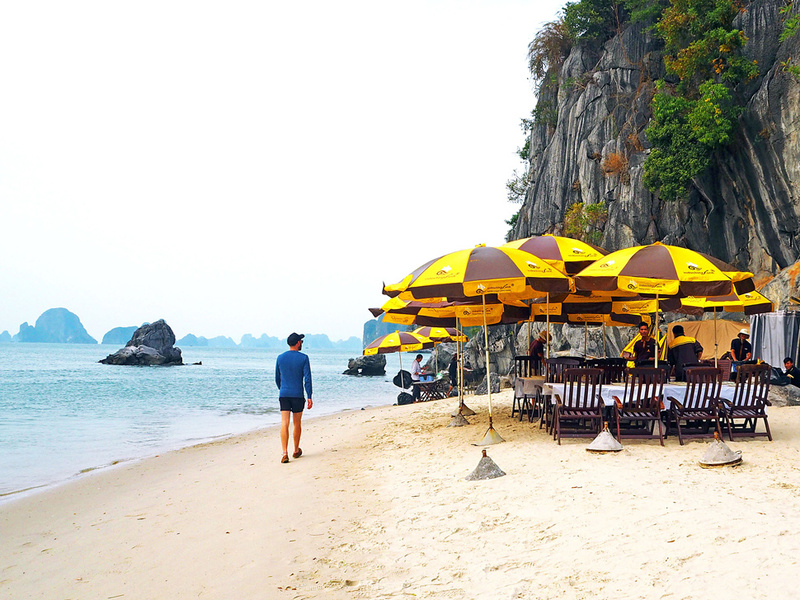 You’ll be surrounded by the sea and limestone pinnacles only and have the chance to enjoy the quiet of this amazing place much better than in Ha Long Bay. LET’S GET THIS LUXURY HALONG BAY CRUISE STARTED! On the morning scheduled for our departure a luxury van collected us at our hostel in Hanoi. I can’t deny that when we first saw it our feeling was discomfort. After a couple of months travelling by local buses in Southeast Asia we were used to experience the local life of the places we visited. That’s why watching the outside world from behind the windows of a luxury van felt a bit strange to us. This made me realize how different a package holiday is from the kind of travel we were taking. Inside that elegant van we felt like we were in a bubble, which was too detached from the real world outside, but hey, we booked a luxury cruise and it didn’t take long before we got used to comfort again! Once we arrived at the Ha Long harbour we got ready to step on board of our fancy wooden cruise ship. The Dragon Legend is truly spectacular! It features an elegant dining room, a huge deck with rows of sun loungers, an outdoor jacuzzi and even a Spa. Our large cabin was very romantic. 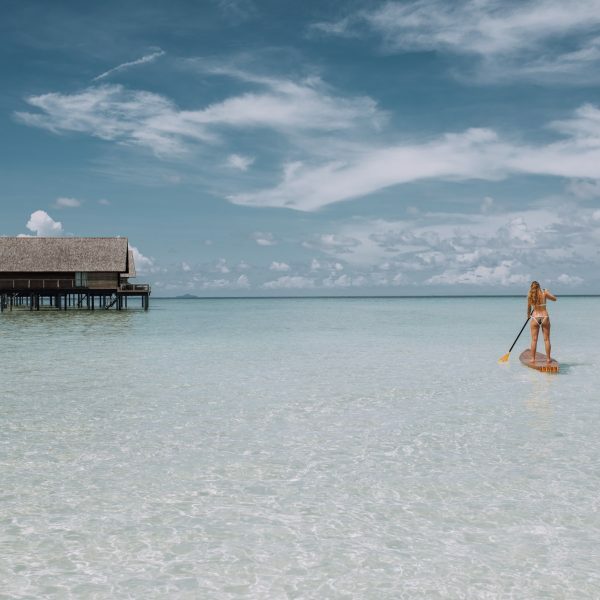 The wooden floors and ceilings, the dreamy bed and a window with a panoramic view on Bai Tu Long Bay helped make the atmosphere even more charming. Not to mention our fantastic bathroom and the romantic bathtub with a view. 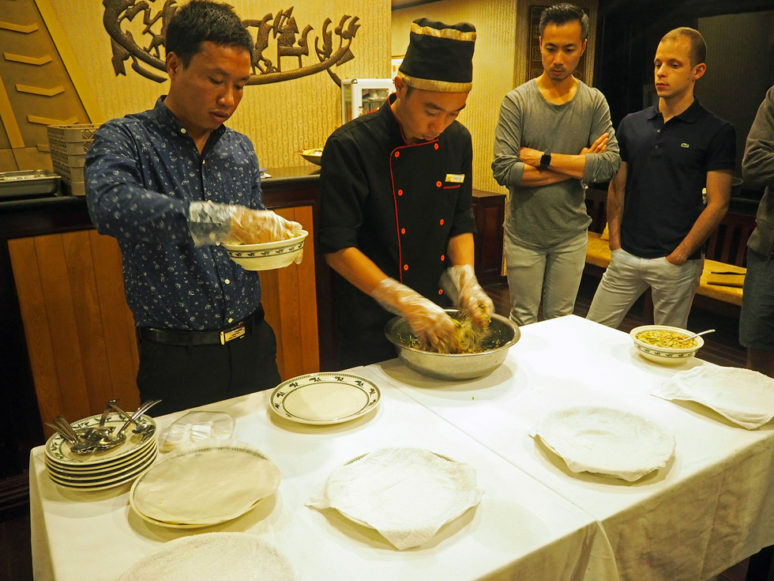 We really enjoyed everything that the Dragon Legend offered, including the delicious food that was specially cooked for us with vegan variations. 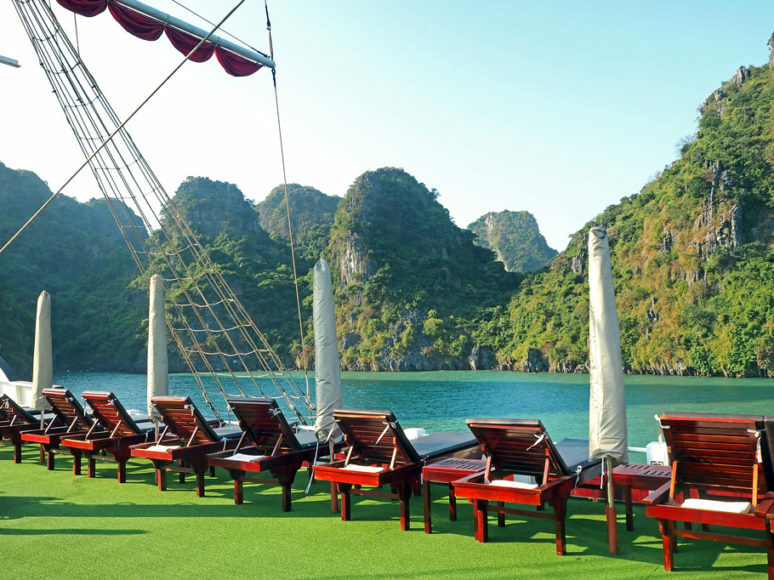 If you take this luxury cruise you won’t have much time to lay under the sun (unless you want to, of course) because the Dragon Legend and Indochina Junk give you the opportunity to join diverse activities. All these are led by a professional guide, who will give you tons information about the bay and the people living there. 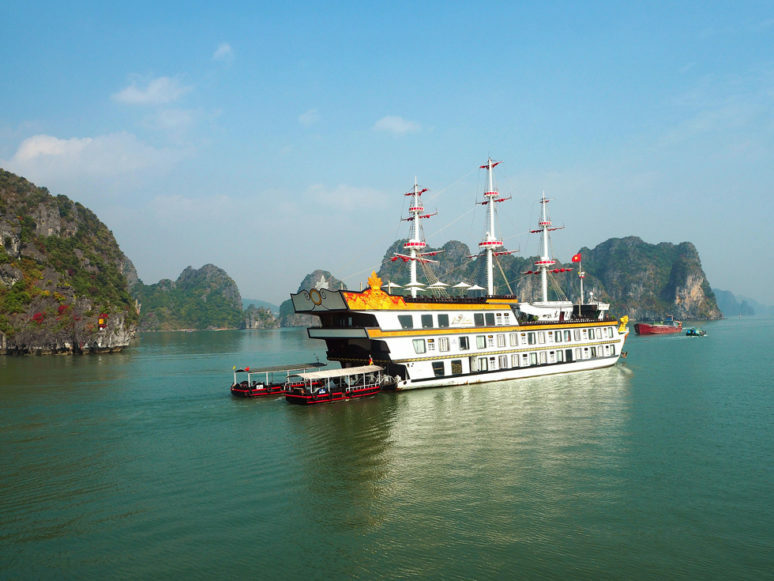 Here are some of the activities and visits, which made our experience in Bai Tu Long Bay even more exciting! Paddling through the limestone isles was incredible. They literally look like they’re out of a fantasy movie. Getting close to those other-worldly pinnacles with a kayak is the best way to perceive the mystical vibe of this incredible place. The Dragon Legend Chef and our guide taught us how to prepare Vietnamese spring rolls. We had the chance to make some, which were later deep fried by the kitchen staff, so that we could eat our own delicious hand-made spring rolls as appetizers before dinner. So good! On our second cruise day we also had the chance to step onto one of the beautiful islands we passed by and visit a limestone cave. To reach the entrance of the cave we had to walk up a steep path, which led us to a nice panoramic spot. After admiring all the incredible stalactites and stalagmites, the Dragon Legend crew prepared a great barbecue on the beach for all the guests (of course for us the chef prepared a delicious vegan barbecue). 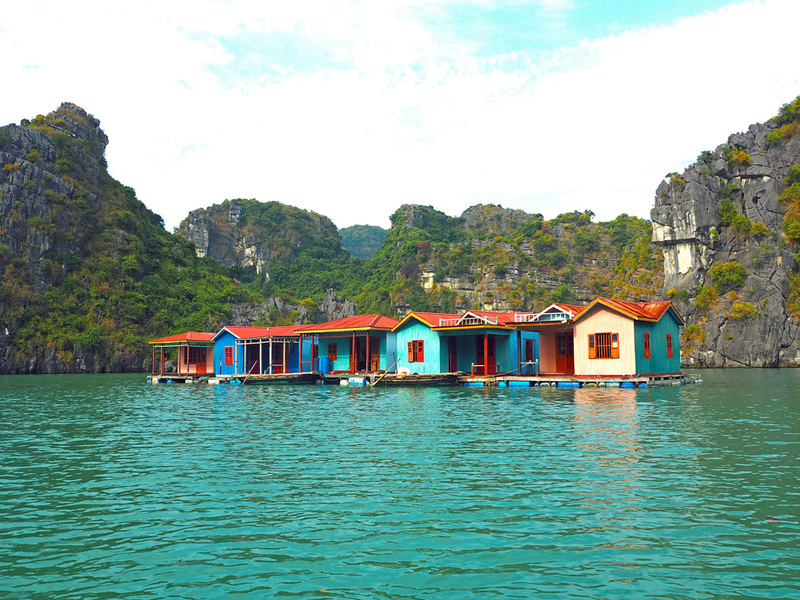 One of the most interesting things to do in Bai Tu Long Bay is visiting a floating village and learning how people live in floating houses located so far away from the mainland and all the basic facilities of the modern world. There’s no supermarket nor hospital there, just cute wooden shacks that peacefully float on the water. The sustenance of the locals depends exclusively on fishing and oyster farming and when somebody gets sick, they must be brought to Ha Long City by boat. Nowadays, by order of authorities, the residents have to move to the mainland to ensure children’s education and better life conditions. It’s such a different world from the one we are used to. 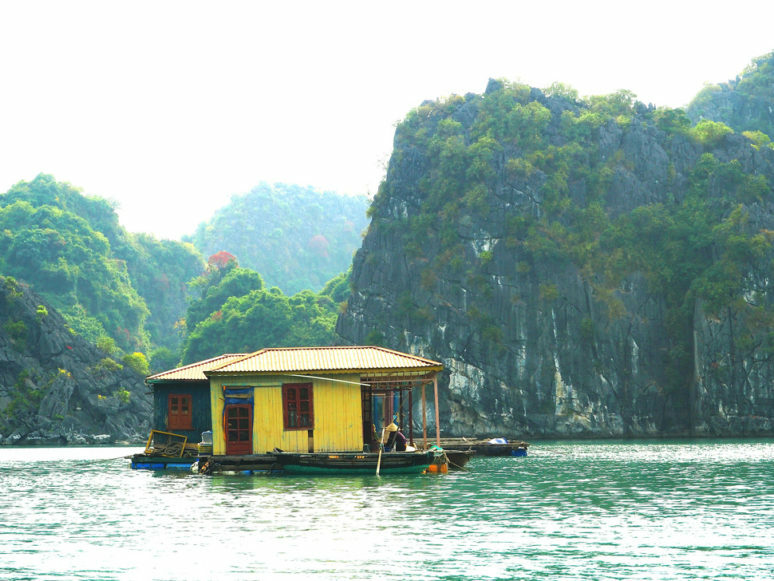 That’s why these picturesque floating villages with their colored houses are a must-see attraction both in Ha Long and Bai Tu Long Bay. 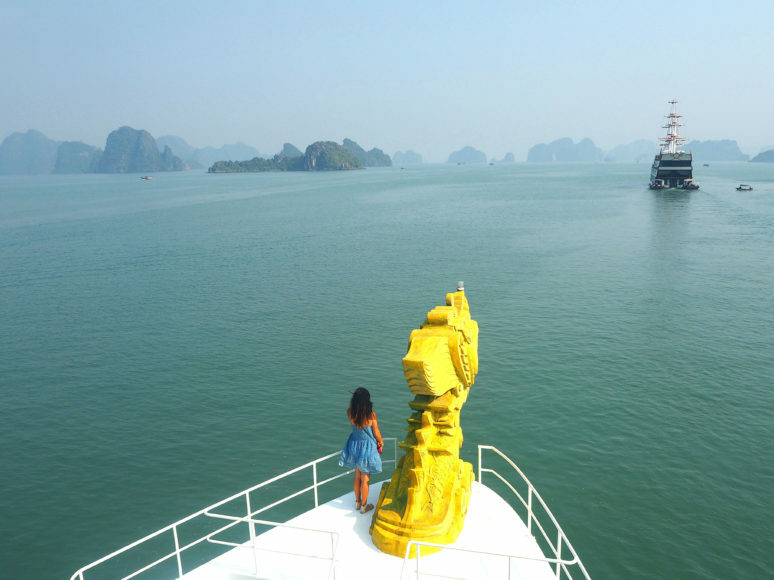 The cruise definitely met our expectations, and it’s a great way to visit one of the most fascinating places of Vietnam. Our comfortable and wonderful ship helped make this experience even more memorable. In the morning, opening the curtains at the window of our elegant cabin to enjoy the insane view on the bay was priceless! Have you been to the Vietnam or taken a luxury cruise? If you have any additional tips for our readers or questions please leave these in the comments below. What a scenic cruise! Great photos. I think I would have been the most excited for the learning to make spring rolls part. Mostly because they are my favorite! Thank you Allison!!! I’m glad you liked my article! Yeah, spring rolls are so yummy!! It’s been great learning how to prepare them, now we can make spring rolls at home anytime we want! ? Oh wow! I’m definitely inspired to take this trip now! Hi Kay!! I’m happy that my article inspired you to take this trip! 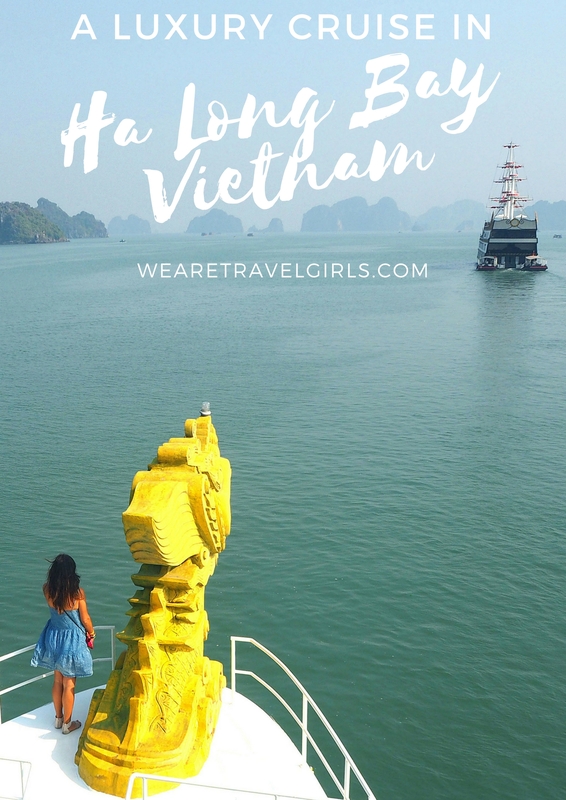 Vietnam and Ha Long Bay are so worth a visit!! 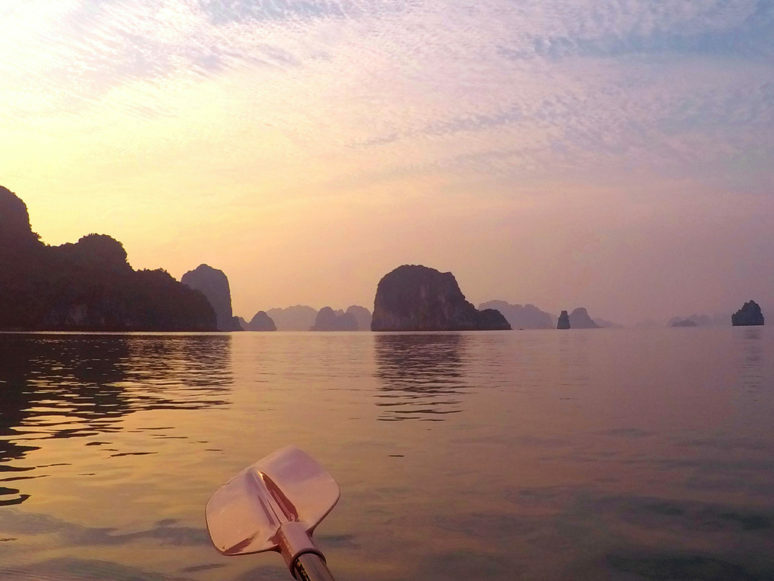 Love this blog – Halong Bay looks absolutely beautiful! Hi when did you go on this cruise? I am thinking of going in May but scared of the weather. Hi! I went in December, I don’t know how the weather in May will be… Sorry… :-/ Anyway, I think a visit to Halong Bay is always worth it 🙂 Hope you’ll find a great weather! Have fun! !